This kit gets you working nearly right out of the box. The included carry case keeps everything protected and together between jobs. When impact drivers first came on the scene their brutish power and industrial weight kept them on the professional side of the tool world. Now, with the development of trick motors and long-lasting rechargeable batteries a tool like the Hitachi WH18DBDL 18V Lithium Ion Brushless Impact Driver comes on the market aimed squarely at the home shop/DIY crowd. The power remains but new controls keep you in charge. The Hitachi WH18DBDL 18V Lithium Ion (3.0 Amp Hour) Brushless Impact Driver develops a very stout 1,420 in-lbs of torque with an impact rate of 0-3200 BPM and no-load rotational speeds of 0-900/1400/2000/2600 RPM. A key to the usability of this tool is the control over power and speed. The Hitachi WH18DBDL 18V Lithium Ion Brushless Impact Driver comes equipped with the popular 1/4" Hex tool-free chuck so you can use all of the tooling you already have. It has a (switched) LED work light just below the chuck, a comfortable ergonomic grip area and an optical trigger switch that gives true variable speed control. 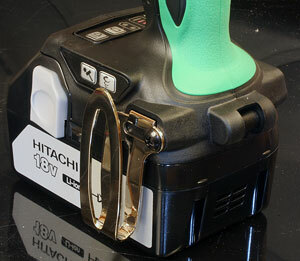 When moving from one job to the next you can hang the Hitachi WH18DBDL 18V Lithium Ion Brushless Impact Driver on your belt with the metal hook. Despite the list of features the Hitachi WH18DBDL 18V Lithium Ion Brushless Impact Driver weighs just 3.7-lbs! The Hitachi WH18DBDL 18V Lithium Ion Brushless Impact Driver reviewed here comes with the impact driver itself, two 3.0Ah 18V Lithium Ion Slide-Type Battery packs, a 14.4-18V Lithium Ion Slide-Type Battery Rapid Charger and a carry case. The brushless motor (left) is small for the power it delivers. 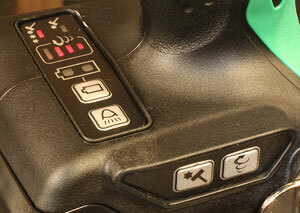 The control panel at the battery (right) helps you apply the power of this tool as needed. The Hitachi WH18DBDL 18V Impact Driver uses a state of the art brushless motor that delivers more power and up to 50-percent more run time on the battery power. Brushless motors also require essentially no maintenance so they run longer while depending on you less. Brushless motors also seem to respond to electronic variable speed controls better which means it is easier to hold a desired RPM. This unit features an optical speed control that is by nature highly wear resistant. The Hitachi WH18DBDL 18V Lithium Ion Brushless Impact Driver also has push button controls that let you select from 4 different motor power ranges that make it easier yet to control. The Hitachi WH18DBDL 18V Lithium Ion Brushless Impact Driver has a type of control panel incorporated into the grip just above the battery. This panel lets you select the level of motor performance your job needs to better control the power of this tool. This control is most important when working with smaller fasteners to avoid breaking them or stripping out the holes. First, you can select between the Limited and Continuous impact modes. Limited mode makes it easier to “tap in” smaller fasteners with more control. Continuous more or less “lets it rip” for the larger fasteners and tougher jobs but you still have to pay attention. The Hitachi WH18DBDL 18V Lithium Ion Brushless Impact Driver has considerable power that needs to be respected. The included charger (left) and battery packs will keep you working far longer than you might think,. The 1/4" chuck and LED work light (right) make this tool very easy to work with, using bits you already have. The Hitachi WH18DBDL 18V Lithium Ion Brushless Impact Driver comes with two 18V 3.0Ah Lithium Ion slide-type batteries that provide fade free power from a much lighter pack than the previous battery types. Another big plus is that the Lithium Ion packs have a life span around three times as long so the value is extended even more. 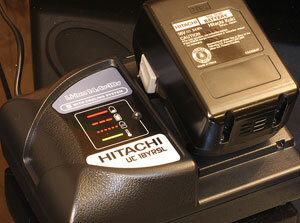 The AC charger is fully automatic and uses a single light that flashes to keep you informed of its progress. A chart next to the light explains what the current flashing means. Packs are refreshed in around 45-minutes. The charger has a built in cooling fan to help your packs and charger function more consistently and last longer. 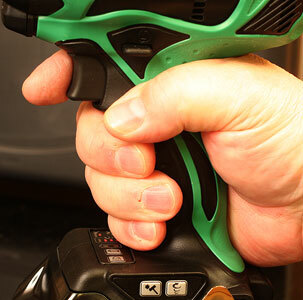 A button in the base of the Hitachi WH18DBDL 18V Lithium Ion Brushless Impact Driver lets you check the state of charge of the battery. During the evaluation I found this “gauge” to be more accurate than many I have seen in recent years. Using the Hitachi WH18DBDL 18V Lithium Ion Brushless Impact Driver is easier than many of the older impact drivers thanks largely to the control Hitachi builds into this tool. That control is even more important with the brushless motor that can surprise you with the effortless way it can develop power. The grip area (left) is very comfortable and balanced. You can hang this tool on the belt with this clip (right) that can be moved to either side of the tool easily. The grip feels good to the hand and combined with the trim motor housing helps balance the tool so that you are not fighting it during use. The trigger and reversing switches are logically placed and easy to work. 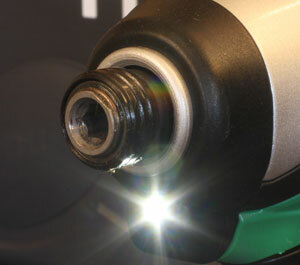 I especially like the optical trigger as it is very smooth and works the same way every time. Learning to apply only the power you need is important and easier with this type trigger switch. 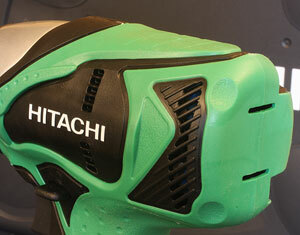 One thing the Hitachi WH18DBDL 18V Lithium Ion Brushless Impact Driver is not lacking is brute power. The brushless motor is capable of generating more power than most of us will need but that means that this tool is not straining. I drove long, large-diameter lags and big wood screws without issue. Keep the bit or socket in solid contact and the fastener magically sinks into the surface. I also was able to install relatively small fasteners with plenty of control to avoid stripping or damage. The LED light really does make working in low-light situations easier and I like that it has its own switch. It’s not a glitzy add on meant to do nothing but impress you before buying this tool. Throughout the evaluation the Hitachi WH18DBDL 18V Lithium Ion Brushless Impact Driver was easy to use, did exactly what I wanted and applied the power I wanted. Predictability is important with a tool that has the available power present here. The overall feel is very good, comfortable and much lighter than I would have expected. I was also surprised by the battery life which on many impact drivers was lacking. 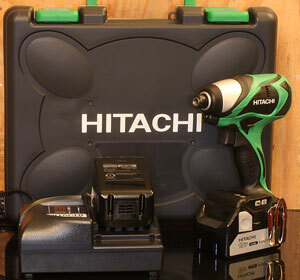 Not so with the Hitachi WH18DBDL 18V Lithium Ion Brushless Impact Driver that seems to run longer than anticipated. If you install large or tough fasteners be sure to check out the Hitachi WH18DBDL 18V Lithium Ion Brushless Impact Driver. This is a well-made tool that comes with plenty of power but just as importantly the ability to control it. The Hitachi WH18DBDL 18V Lithium Ion Brushless Impact Driver has a manufacturer’s suggested retail price of $450.00 but it looks like the street price is settling in the $325.00 (5-19-2012) range. Considering the advanced motor technology and state of the art battery system this is a good value. I have been using an impact driver in my shop for a few years now and continue to be surprised at how often it comes in very handy. Installing lags and large screws justify the expense but other tasks such as assembling machines and tools as well as other “around the house” jobs benefit as well.